Playing Outdoors has a new meaning to us now. As of one week ago from today we have a new house with a real YARD! For the past two years we have been renting a townhouse and while it did have a little bit of side space it was not grassy or easy to play ball. The streets were not good to ride bikes and the neighborhood did not have many kids. To say the least, we are THRILLED to be in our new house. How are things different? As soon as the kids come home from school they instantly go to their ‘secret hide-out’ which is a circle of bushes that they can crawl through to get to the middle and be hidden. They spend a lot of time here! When the novelty of the game is over they open up our garage door (a garage! yay! no more paying for storage!) and out come the bikes! Our neighborhood is one big circle that is almost a mile long. C’Man and the neighborhood kids love riding around it. O’Bear, at age seven, recently learned how to ride. He is not into it as much and I have to make him ride and practice. He will get better right and WANT to go out? I’ve never seen a child have so much difficulty on a bike! Baby P’Diddy LOVES our new back patio! And I love it too! Each morning we bring out his Little Tikes Truck to ride around, his basketball hoop to shot hoops, and about three different sized balls to kick and throw around. So fun! Yesterday we planted flowers in pots and filled up the bird feeder with seed and hung it out. I’m loving the outdoors lately! So much different than the townhouse where I felt like we were always cooped up. We have a couple of family outdoor activities we like to do too! My favorite is going to the County Park. We have some great parks here with playgrounds, trails, and wide open spaces where we bring the picnic basket and the frisbee. Very enjoyable afternoons! And of course I can’t forget heading to the beach whenever we can. Digging in the sand, riding the waves on the boogie boards, or just sitting and soaking up the sun with a good book. I am spoiled! Take the Clorox2 Play 2Day Pledge at http://clorox2play2day.com for your family to get outside and for your chance to WIN a trip to Yosemite National Park and other great weekly prizes! What does your family love to do outdoors? We were first introduced to Blue Orange Games when I was sent the game Gobblet to review from Heirloom Wooden Toys (a fantastic store by the way!) back in February. 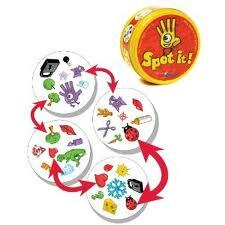 It’s a fun strategy game like Tic-Tac-Toe and it has become a family favorite! Using cards with a variety of images ranging from the charming to the ordinary, encompassing a range of situations, players improvise stories. Take a journey into storyland… Whether engaged in a friendly contest or creating a story together, you will love the way Tell Tale gives your imagination a chance to shine. 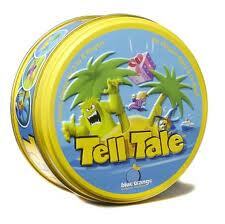 7 great family games and thousands of short stories to tell are included in this tin. Blue Orange sent me a sample of these games and all opinions are my own.